Make plans to see the finest stringed instruments in the Southeast on display in Burnsville, NC, during the inaugural Mountain Acoustics Luthier Invitational on Memorial Day weekend, May 24-26, 2019. The event celebrates hand-built stringed instruments with an emphasis on the artists who craft them and the musicians who play them. Luthiers specializing in crafting guitars, mandolins, ukuleles, dulcimers, harps, violins, basses and banjos will travel to Burnsville from North Carolina, South Carolina, Tennessee, Georgia, Virginia and West Virginia. 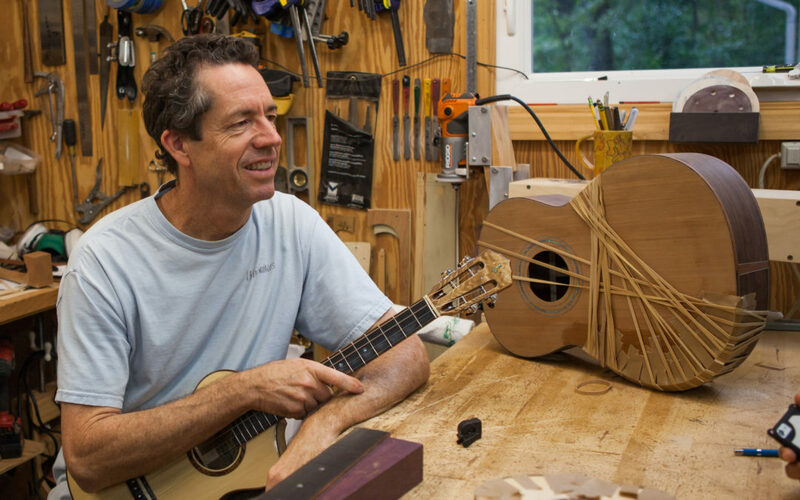 Enjoy live music throughout the weekend as luthiers showcase their instruments to the public and lead workshops on songwriting, guitar and ukulele playing, and the luthier craft. On Saturday night, guitar virtuoso Kaki King headlines a concert at Parkway Playhouse. Rolling Stone named King its first female “guitar god.” Beloved local duo Ron and Minnie Powell open the evening, and Asheville artist Nick Gonnering performs second. Concert tickets and a complete listing of activities are available online at www.MountainAcoustics.com or by calling (828) 682-4285. Check out our Blue Ridge small town spotlight for more information about Burnsville, including lodging.